Two Car is a motorbike side car racing and it was made to celebrate Silver Link´s 10th Anniversary. The Chapter starts in a highroad on a Japanese Island known for having no speed limitations, so a lot of people with hunger for velocity go there. 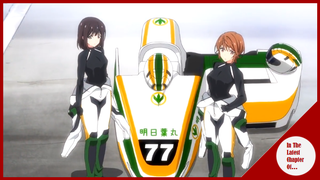 In one road, a bunch of High School girls and other people have gathered, an exhibition race from various highschool girls will appear, it´s a motorbike with side car race. There are various famous teams in there, although the locals won´t give in. The name of this locals are Yuri and Megumi from Miyake Girls High school, and they won´t let them be defeated by a bunch of visitants!...Although their teacher is not so sure about that since both girls are…like always, and that’s no good. We travel now in time, it is the morning of any school day, both girls, Yuri and Megumi, both neighbors, both childhood friends, and both have a family inn are running, it seems they are late! Quickly they jump on their bike with side car and do their very best to reach on time! Our girls have reached their destination on time… barely, in there Ayaki, the mechanic girl of the club, was awaiting for them; both Megumi and Yuri where arguing about some deficiencies the other girl made on their run towards this place. The Mechanical girl ask them if coming sooner would help? The answer is a clear no, going sooner would be cheating on a race! The teacher comes and ease the moods, although there is one person missing, their coach, a man with an awesome record, and he will push this girls to their limits! The race continues and the other girls are doing their best showing their powers on this race! At the same time our girls aren´t doing so hot right now, they are on the last place and no one can see any indicative that such thing might change in the future. Some time on the past Yuri is driving with the coach, their route has finished and he compliments her by saying that she is very close on beating his mark, just by mere seconds! Now it´s time for Megumi. They start the route and the coach is complimenting the parts where Megumi is lacking by putting or lifting weight, it´s like he understands her…At the same time Yuri had a similar experience… It is obvious that both girls have their hearts beating hard. The racing continues and all the other girls are doing their best use of their skills to win! Sadly, our girls still are on a terrible position on this race. Other memories coming from them and it is when they made their sidecar motorbike, now they needed a name…It is then when the Coach comes and offers a name… Ashitabamaru Since it’s a grass that its abundant here, and its one that even if it falls, it will go back up again! A fitting name. Back on the present, the girls start putting themselves serious and start running harder and harder, their movements and decisions have become sharper and sharper. They are start acting like a sole unit! Now on the past, the Coach has an announcement… he is going to move out of the country, the girls ask why?! They need him to teach them and to improve their skills! Still, the Coach says that he has show them everything this girls needed, heck in a few years they could surpass his record! Besides, he has a dream to achieve, therefore he is going to London, to the Island of Man, where the world´s most recognized side car circuit is! And if he wants to win he needs to live in there in order to understand the road and advance his chances of winning, therefore he is going now. Back on the present the girls start gaining positions and leaving the other places behind! Later, both girls in their respective houses are writing a letter to the coach, where they hope to see him alone… They have something important to tell him.. A Confession perhaps? After school, both girls are waiting for him ignoring the intentions of the other, they start talking like…if they needed to be studying or that their family business needs them?! In any case, the other needs to go now! This is their solo time with Coach! The Coach has came and salute both girls, he ask them what do they want? Both girls looks at each other a little embarrassed; but still they close their eyes and are ready… Here comes nothing. ¡They wish the best for the Coach on his new adventure!... Ok, I was expecting and at the same time not expecting that; anyway, The Coach is happy and they are too. The Girls keeps advancing and passing to every other team on the race, they are now close to the first place just needs a little more and they will make it! They come closer and closer… And they did it! They have won the exhibition match! A Nice start for our girls here! The other second and third places are happy too with their results too!...For part of our girls, they go closer and closer, it seems they will embrace each other in celebration, and here comes… The Punch?! Both of them punched each other on the face and fell to the ground!... A total double K.O.!! Anyway, this exhibition has been a success and has everyone, participants and audience, eager for what will come when the true competition begins! A very good first chapter! Although it wasn´t prefect since it had some pacing problems regarding how it changed from the race to the stuff before it, although it´s nothing that decremented my enjoyment in any way shape or form; but one must be careful since that pacing could case troubles at the moment of trying tog et excited for the race. What I liked is how likeable both Yuri and Megumi are, their story together, their rivalry, how it seems both where pointing towards the same guy and how both basically had the same mindset! Another point that I truly liked was how good the race felt, with every racer showing in what theya re good for and that made the whole thing exciting and eager to see when the true stakes are at the order now! Finally… Yeah, I know that I said back when I finished Monster Hunter Stories: RIDE ON anime (the newest chapters are quite good though) that I will take a break in order to rest a little… And I did rest; but I also found another thing… I didn´t needed 3 months of rest, just a few weeks and I was ready to come back in action! Having said that, now let us go together to this new racing journey filled with nice humor, exciting moments and pretty girls!